Altarpiece Paintings, Reredos, Retables, Triptychs Painted in Venice. height of the Renaissance in Venice. Titian and Venetian Colour Painting. In this article we examine the development of Venetian altarpiece art during the sixteenth century - mostly involving reredos, retables and triptychs - and show how this tradition was modified by the major artists of the period. For a number of reasons this is by no means an easy task. Firstly, the period in question, spanning as it does the end of the Early Renaissance (c.1400-90), the High Renaissance (c.1490-1530), Mannerism (c.1530-99) and the beginnings of the Baroque (1600-1700), was marked by radical changes in artistic theory, principles of composition and forms of expression. Secondly, within the orbit of Venetian painting there existed local schools with their own traditions and standards of Biblical art; and there was an especially marked discrepancy in quality between the products of Venice itself and those of the provincial centres of the mainland. Finally, it is often difficult to accommodate the very original and idiosyncratic contributions of the greatest Old Masters within a rigid scheme of development. Nevertheless it is possible to discern some kind of pattern of Christian art, whose origins can be traced back to the last quarter of the 15th century. At that time there emerged a distinctive formula for Venetian altarpieces, which was altered and refined in the 16th century. Note: altarpieces typically came in the following basic formats: diptych (2-panels), triptych (3-panels) or polyptych (multi-panels). 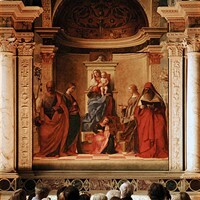 A starting point is provided by the visit which Giovanni Bellini (1430-1516) must have made to Pesaro in connection with the commission for the grandiose Coronation of the Virgin (Museo Civico, Pesaro). This picture, which was almost certainly painted some time between 1471 and 1474, is radically different from an altarpiece which Bellini himself had painted about 1464 for the church of SS. Giovanni e Paolo in Venice. There he had remained faithful to the archaic formula of the polyptych, a scheme which continued to retain a certain popularity until the very end of the century, especially in the provinces. But in the Pesaro Altarpiece the ornate frame of carved and gilded wood, enriched with a painted Pieta and 15 smaller pictures in the predella and uprights, surrounds a single large square panel painting which is treated as a unified space with a central vanishing-point. Within this space Christ and the Virgin are shown on an elaborate marble throne, flanked by four saints whose arrangement is analogous to an architectural niche, an impression heightened by the pattern of foreshortened tiles on the floor. In its luminosity as much as in its architectonic grandeur this painting seems to reflect Bellini's direct experience of the altarpiece for the church of S. Bernardino in Urbino (now in the Brera, Milan), by Piero della Francesca which dates from just this period. Soon after his return to Venice, Bellini received a fresh impetus to follow the path on which Piero had set him, with the arrival in 1475 of another artist of exceptional originality, Antonello da Messina (1430-79). 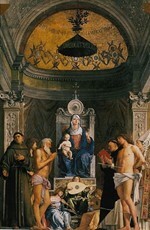 In his altarpiece for the church of S. Cassiano in Venice (partly preserved in Vienna) Antonello showed the Virgin and saints framed by an architectural niche, much as Piero had done; but here for the first time the Virgin was placed on a high central throne, thus creating a stronger formal relationship between the figures and their setting. This scheme re-appeared, probably about 1487, in Bellini's S. Giobbe Altarpiece (Venice Academy Gallery), where the painted architecture was directly linked to the real architecture of the frame, giving the illusion of a chapel opening directly out of the church. The arrangement at S. Giobbe was to be further elaborated in 1510 by Vittore Carpaccio (1460-1525), whose Presentation of the Virgin (Accademia, Venice), painted for the altar immediately opposite Bellini's picture, provided a close counterpart to it. At S. Giobbe Bellini gave the Venetian altarpiece the basic form which it was to retain well into the sixteenth century. He himself used a similar scheme in the church of S. Zaccaria in 1505, and it was also adopted by lesser artists, for example by Alvise Vivarini, and by Cima in his altarpiece at Conegliano. Of course, each master modified the formula according to his own individual style of painting; Bellini created diffuse chromatic harmonies by using subtle glazes, while Vivarini and Cima preferred clear smooth surfaces modelled by the harder light of the midday sun. In many religious paintings of these years we also find signs of a new pictorial interest in the natural world. Among works of the fifteenth century, this is true of Montagna's Nativity (Museo Civico, Vicenza) and soon after 1500 of Bellini's Baptism of Christ in Vicenza. But it was not until 1505 at S. Zaccaria that he created a standard form of architectural structure in a landscape, establishing a formula that was to persist in Cima's work right up to his St. Peter Enthroned of 1516 (Brera, Milan). The most radical innovation in the process of combining the traditional scheme of the altarpiece with a landscape painting background, however, was taken by a younger artist who had emerged from the school of Bellini, namely Giorgione, in his picture at Castelfranco painted about 1504. In this masterpiece Giorgione (1477-1510) profoundly modified the hieratic conception of the altarpiece established by Bellini, introducing a new kind of naturalism both in the setting and in the figures, which was to have a lasting importance throughout the sixteenth century. In its basic composition it may reflect the influence of Emilian artists such as Costa and Francia, but no less relevant was the contemporary intellectual climate in and around Venice, as manifested both in the interest in physical phenomena fostered by the study of Aristotle at Padua and in the arcadian poetry of Pietro Bembo, who is known to have been an admirer of Giorgione. The freedom of expression and composition thus initiated by Giorgione soon found a widespread response among his contemporaries, for example in Sebastiano's asymmetrically organised altarpiece for the church of S. Giovanni Crisostomo of 1510-11, although in this instance the example of the Florentine Fra Bartolommeo (1472-1517), who was in Venice in 1508, may also have been relevant. The clearest signs of Giorgione's importance, however, can be seen in the greater prominence given to landscape, especially by the aged Bellini in such works as the St. Jerome of 1513 (San Giovanni Crisostomo, Venice), the Virgin and Eight Saints of the same year (Murano) and the Deposition of Christ of 1515 (Accademia, Venice). At about this time an equally revolutionary approach to religious art in Venice was initiated by Titian (c.1485/8-1576), who emerged as an independent master around 1510. In a work of this period, the Virgin and Child with St. Anthony and St. Koch, he was still deeply influenced by Giorgione, but in his picture of Jacopo Pesaro Presented to St. Peter he transformed the traditional altarpiece into a celebration, on a human rather than a celestial level, of a great Venetian family. The powerful realism of the figures probably reflects the impact made on the young artist by the Madonna of the Rosegarlands (Narodni Gallerie, Prague), painted by Albrecht Durer in Venice in 1506. In this masterpiece, which was a landmark in the development of Venetian naturalistic painting, Durer had included portraits of the Pope and the Emperor as well as other contemporaries, thus allowing the reality of everyday existence to enter the sacred realm of the Virgin and saints. In his Assumption of the Virgin, painted for the church of Santa Maria Gloriosa of the Frari between 1516 and 1518, Titian's preoccupation with sensual beauty and truth to nature even troubled the sensibilities of his Franciscan patrons. But his work was soon publicly acclaimed, and later Lodovico Dolce was to compare it to the masterpieces of Raphael and Michelangelo. Then in 1526, while he was still enjoying this success, Titian provided another picture for the same church, the Pesaro Madonna. Here again the real world is strongly in evidence, in the form of six members of the Pesaro family kneeling before a high podium on which are grouped the Madonna and saints. The composition is strikingly original, since the conventional frontal presentation is replaced by an oblique arrangement which emphasises the ascending movement towards the redeeming Virgin. In both these pictures a hitherto static type of design is transformed by dynamic movement and brilliant colour. This novel approach, which was to be Titian's greatest contribution to the tradition of the Venetian altarpiece, is still more evident in the most famous painting he ever produced, the Death of St. Peter Martyr, which was installed in the church of SS. Giovanni e Paolo in 1530 and destroyed by fire in 1867. The achievements of the other artists active in this period, both in Venice and on the mainland, are inevitably less significant. Probably the most influential of these lesser masters was Palma Vecchio (1480-1528), whose use of rich, sumptuous colour pigments reveals a clear debt to Titian. He is particularly associated with a distinctive type of horizontal composition showing the Virgin with saints and donors in a landscape. The slightly pedestrian tone of his work, as well as his popularity in the provinces, contributed to the diffusion of this formula in the Venetian territory in Lombardy, where it exerted a certain influence on such painters as Previtali, Cariani and Licinio. There are links also between Palma and Lorenzo Lotto (1480-1556), especially during the latter's residence in Bergamo, where he developed an increasingly naturalistic style in which the emotions of the figures were echoed in the setting. Outstanding examples are the two great altarpieces of 1521, for S. Bernardino and Santo Spirito, in both of which Lotto used a formal scheme derived ultimately from Giorgione, but enriched by his personal experience of the work of Raphael. His profound sensitivity to the real world around him remained an important factor in his paintings of the 1530s for patrons in the Marches, such as the altarpieces at Jesi and Ancona. The ideals of another notable artist of this generation, Paris Bordone, place him somewhere between Palma and Lotto, at least in his earlier years; but he was more interested in colour than composition. It is less easy to fit the altarpieces produced in other provincial cities into the pattern of development centred on Venice. Thus the major figures of the early sixteenth century in Verona, Cavazzola and Caroto, belong essentially to a tradition going back to Andrea Mantegna (1431-1506). The Brescian Romanino, by contrast, was at first more closely linked to the Venetians, for example in the altarpiece he painted in 1513 for the church of S. Giustina in Padua (now in the Museo Civico); but after he returned home his style became more naturalistic, under the influence of Leonardo's followers. The work of the other Brescians - Savoldo, Moretto and Moroni - shows a similar compromise between the aristocratic ideals of Venice and the realism of Lombardy. In the formal structure of their altarpieces they were often indebted to Venetian models, particularly to Palma and Lotto, but there was a greater emphasis on narrative content and, increasingly, an over-refinement typical of Mannerist painting, as in Moroni's Mystic Marriage of St. Catherine of about 1570. From the mid-1530s and more decisively after 1540, a set of new aesthetics was taking root in Venice, derived from Mannerist artists in Tuscany and Rome, which was superimposed on the traditional local idiom. At the time the contrast between these two approaches was seen in terms of 'disegno', the Florentine preoccupation with form, and Venetian 'colorito', associated particularly with Titian. The effect on Titian's own work is immediately apparent, for example in his St. John the Baptist of about 1540 in which his concern for 'painterly painting' was subordinated to an assertion of Michelangelesque plasticity. Under the impact of Mannerism the Venetians soon abandoned the harmonious geometrical structures on which their style of oil painting had been based, as well as fidelity to nature and the unity of time and space. Instead, their work became more unrealistic, more overtly dramatic and expressive. Even Titian adapted his style to this new conception of religious art, notably in his two versions of the Martyrdom of St. Lawrence, the first completed in 1559 (Gesuiti, Venice), the second in 1567 (Escorial). For portraiture in Venice, please see: Venetian Portrait Painting (c.1400-1600). A significant precursor of this development was Pordenone (1483-1539), whose altarpiece for the church of S. Giovanni Elemosinario in Venice, painted about 1535, already shows mannerist features, both in the crowded and unnatural composition and in the rhythmic energy of the poses. But the most extraordinary manifestations of the new compositional structures appear in the paintings of Tintoretto (1518-94), beginning around 1540. His Christ Among the Doctors, for example, seems quite unrelated to any religious art produced in Venice up to that time. Another important innovator was Andrea Schiavone, who was largely responsible for introducing the sinuous figurative idiom of Parmigianino (1503-40). He also played a major role in establishing a new type of composition in which figures and events are expressions of forms and feelings rather than geometrical images in an architectonic framework. Pictures such as his Adoration of the Magi of about 1547, or the Adoration of the Shepherds painted by his follower Mariscalchi around 1560, with their closely packed, highly agitated compositions, seem to anticipate the dynamism of Baroque painting. The same is true of virtually the whole of Tintoretto's oeuvre, in terms both of the intense movement which pervades all the figures and of the dramatic nocturnal illumination, with the emphasis on broken highlights. In the second half of the century several other artists were moving in the same direction, notably Jacopo Bassano (1515-1592) and Palma Giovane, who approached the eclecticism of the Baroque, particularly in his figures, as for example in the Pieta of about 1611. Bassano, however, perhaps because he was brought up in the provinces, often seems to have been readier to revive compositional schemes more in keeping with the local traditions of the altarpiece. Particularly in his early works this was manifested by his choice of architectural motifs, and later by his arrangement of figures and by his adoption of a central vanishing-point, as in the Adoration of the Shepherds of around 1570. The most serious attempt to reassert the distinctively Venetian approach to the altarpiece, however, was made by Paolo Veronese (1528-1588). 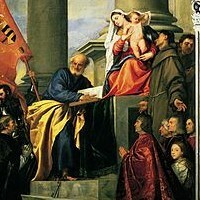 In an early work such as his painting of 1551 for S. Francesco della Vigna in Venice, he based his design directly in Titian's Pesaro Madonna. Later he tried to achieve a new equilibrium primarily through compositions based on a harmonious pattern of colours, for example in the altarpiece now in the Chrysler Collection, of 1562, or in the one he painted for S. Sebastiano around 1565. In such pictures the iconographic content is conveyed by brilliantly coloured figures arranged in the foreground, and by a highly refined draughtsmanship which gives his flowing forms a superhuman beauty. No painter better demonstrates how the intensely vital artistic culture of Venice was able to reject imported aesthetic ideals and once more assert the typically Venetian concern with chromaticism. A highlight of the Grand tour, Venetian altarpiece paintings can be seen either in situ, in churches across Venice, or in most of the best art museums in the city, notably the Accademia. For the impact and importance of Venice painters on European art, see: Legacy of Venetian Painting (after 1600). We gratefully acknowledge the use of material from Terisio Pignatti's article on altarpieces, published (1983) by the Royal Academy, London.